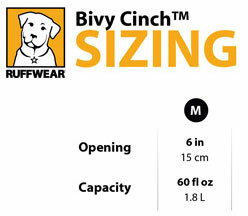 Minimize and simplify by storing and feeding from the Bivy Cinch, a multi-use fabric bowl. Welded construction and a unique closure allow kibble storage and grazing during multi-day adventures. Engineered collapsibility makes it portable. Ideal for backpacking, camping and hiking expeditions, this welded, waterproof bowl is designed to store kibble during long adventures. A light and compact bowl that takes up minimal space in a pack. Not sure? View the Ruff Wear Bowl Comparison Chart to help find the one right for you. Click the button below to add the Bivy Cinch to your wish list.